For the evaluation of the success of your campaigns, we offer the possibility to create individualized reports. 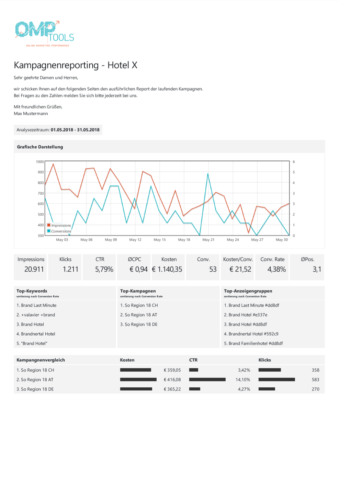 Here you can choose whether a report should be created for the entire account or for individual campaigns. Both the desired analysis period and the key figures to be compared can be selected for graphical representation. In addition, the listing of the top 15 keywords as well as the listing of the top 10 ads can be selected according to different parameters (clicks, average CPC, etc.). For the creation of the report, there are optional display options such as the time comparison to a previous period, to a same period in the previous year, or at a user-defined period. In addition, it is freely selectable whether a list of all campaigns, the display of the footer or the presentation of the glossary is desired. Especially for agencies, the additional function is to place 2 logos in the header of the report. In addition, there is the option of automatically creating the report and sending it automatically to a specific recipient.